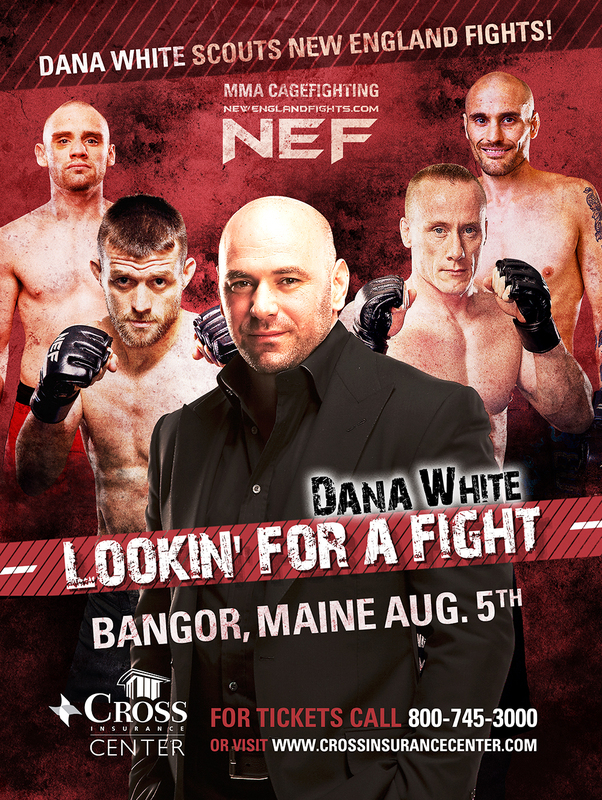 FOR IMMEDIATE RELEASE: Bangor, Maine (July 12, 2016) – Earlier today, New England Fights (NEF) announced the fight card for the promotion’s August 5, 2016 event at the Cross Insurance Center in Bangor, Maine. Ultimate Fighting Championship (UFC) President Dana White will be present at the event to scout talent for his web show Dana White: Lookin’ for a Fight. Eight professional mixed-martial-arts (MMA) bouts will be presented before White. Sixteen competitors will look to impress the UFC boss and earn a contract with the largest MMA promotion in the world. In the main event, “The Fearless” Alfred Khashakyan (7-2) will face Brazilian prospect Ricardo Lucas Ramos (8-1) in a bantamweight contest. Based out of Glendale, California, Khashakyan is a finisher, having won seven of his last eight bouts via knockout or technical knockout. Khashakyan will be in good company on August 5 as his opponent does not believe in letting the judges decide the winner either. Seven of Ramos’ eight wins have been finishes, including five submissions. Maine lightweights Jon Lemke (5-5) and Jesse “The Viking” Erickson (7-5) will meet in a rematch of their Bellator 93 bout from 2013. Lemke won the first battle in Lewiston via first round technical knockout. Both Erickson and Lemke have recently challenged for the NEF MMA Professional Lightweight Title. They are two of the top-ranked fighters in the state at 155-pounds. Local, Bangor-based Young’s MMA will send no less than four competitors to the cage in hopes of winning a UFC contract. “The” Ryan Sanders (10-7), Aaron “Relentless” Lacey (1-0), CJ Ewer (1-0), and Josh “Hook On” Harvey (1-0) will all be in action for the first time at the Cross. In a bout that has all the makings of a “show-stealer,” Brazilian Jiu-Jitsu (BJJ) black belt Jarod “Last Minute” Lawton (4-2) is scheduled to face Mike “The Mustache” Hansen (4-4) in a middleweight bout. Both will be looking to bounce back from losses in their respective previous bouts. Hansen is a former state high school wrestling champion out of Mountain Valley High School in Rumford, Maine.